Photo used with the generous permission of Clinton Gilders. Click on the photo to visit Clinton's Flickr page. Maybe to find a mate, maybe to find new habitat, but most turtles crossing the road are females heading to a nesting site, typically May through July. Females build a nest and lay their eggs in sandy, well drained soil, often in the gravel shoulders of roads. Unfortunately, the Dufferin Marsh is divided by two well travelled roads. A slow moving turtle is unlikely to complete a road crossing without encountering an automobile. Dufferin Marsh Nature Connection members have noticed a significant amount of turtle carnage in 2016, likely because of the increased traffic due to construction and detours. For starters, slow down and pay attention when driving. Turtles are very slow moving animals, and easily avoided by attentive drivers. First and foremost, make sure you are safe. Always move the turtle in the direction it was headed, even if it is away from the water. The turtle knows where it wants to go. If the turtle is fairly small grasp it on either side of its shell between the front and hind legs. The turtle may claw and squirm to try to get away—be sure to keep it low to the ground when moving it to prevent it from getting injured in case it wiggles free. Always make sure the turtle is facing the same direction it was travelling when you have finished intervening. If the turtle is large with a long tail, it is likely a snapping turtle. Snapping turtles have long necks and you’ll want to be very careful not to get bitten. Remember that the turtle does not know you are there to help and is often very frightened, thinking you are a large predator. If they snap, they are just trying to protect themselves. NEVER pick up a turtle by it’s tail (which is part of its spine) as this can seriously injure it. Use a shovel, board or similar type of blunt object and gently coax it across the road from behind. Shove cardboard, a board or a car mat under the turtle and drag it across the road. If you are able to get the turtle to bite on a stick, you may drag it across the road. It may get a little scraped, but turtles, like all reptiles have tough scaly skin. Grab the rear of the shell behind the hind legs, turn it around and gently slide the turtle across the road. Be sure to spin it around in the direction it was headed before releasing it. If you come across an injured turtle, carefully place it in a well-ventilated plastic container with a secure lid and immediately contact the Toronto Wildlife Centre (416-631-0662). Keep it warm and dry, away from air conditioning vents. Do not feed or give it water. Grievously wounded turtles that one would assume are dead may be alive and in agony. Turtles have slow metabolisms and can suffer for days before dying. Even if the turtle is dead, if it is female with eggs the eggs may be harvested. 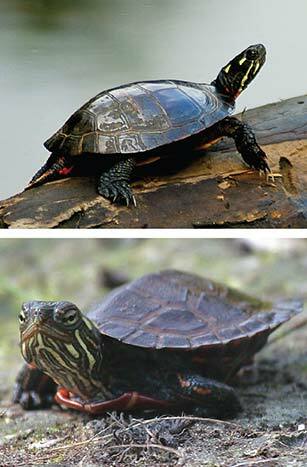 There are two types of turtles that call the Dufferin Marsh home: the Painted and the Common Snapper. Female snappers do not begin to breed until they are 17 to 19 years old; female painted turtles reach sexual maturity at 8 years. The snapping turtle is currently listed as Special Concern under both the Ontario Endangered Species Act, 2007 and the federal Species at Risk Act. The vast majority of turtles do not survive to adulthood, as few as 1% of hatchlings reach maturity. 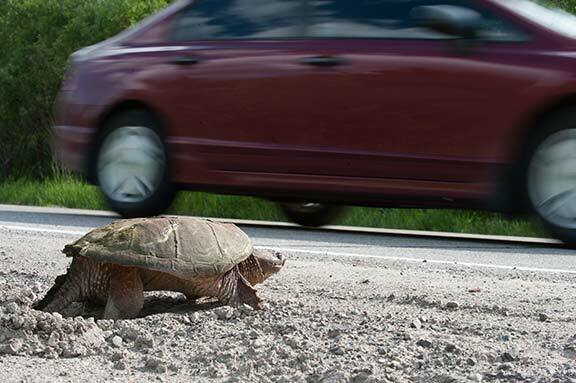 A 2007 study conducted on a road near Long Point Provincial Park found that nearly 3% of drivers deliberately swerved to intentionally run over reptile decoys placed in the middle of the roadway. Because of their high mortality rate, every individual turtle is important to a local population’s stability.